Denmark finds its place among the well developed countries in the world, both socially and economically. With its per capital GDP (nominal) at $59,314 as per the estimates of 2017, Denmark catches the attention of global economic analysts. The gigantic landmass of Greenland (considered as the biggest island in the world) is interestingly a constituent of the relatively tiny sovereign state Denmark. Denmark is one of the Nordic countries like Finland, Sweden, Iceland and Norway, situated in the top region of northern hemisphere. Its overseas territories Greenland and Faroe Islands lie to the west of Denmark. Both Greenland and Faroe islands were once the counties of Denmark. In spite of gaining home rule (self-governance) by Faroe Islands and Greenland in 1948 and 1979 respectively, they continue to remain constituents of Denmark. The Danish hegemonic influence is titular in the constituents and the freedom for internal legislation was delegated to provide requisite autonomy as per the local regional requirements. 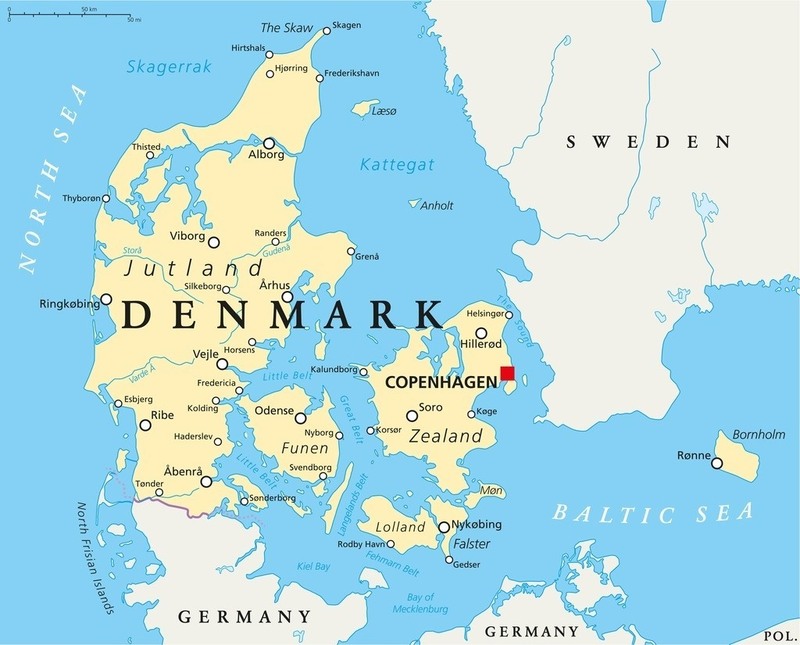 Copenhagen is the capital of Denmark and Danish is the official language of the country. The other recognized languages are Faroese, Greenlandic and German. Due to its close geographic proximity with Germany, Faroese dialect is influenced by German and is often referred to as North Germanic language. Greenlandic is known to have semblance with other languages spoken by eskimos. The lengthy coastline of Denmark in the west is kept drenched by North Sea. The neighbouring Scandinavian countries are Norway and Sweden. Germany is in physical contiguity with the southern border of Denmark. When it comes to the matter of tourism, Denmark never disappoints any curious traveller. If the visitors have an aesthetic eye, they are left a lot more satisfied than expected. The first and foremost structure that needs a special mention is the bronze naked statue “The Little Mermaid” perched permanently on a single spherical rock on the bank of the Langeline pier. The statue makes the onlookers believe that the mermaid has just come out of the water and reached the top of the rock to relax her body after prolonged swimming. The Langeline pier also serves as a park with a promenade to take a leisurely walk in central Copenhagen. The statue of the Little Mermaid , unveiled in 1913, has gained the status of iconic symbol of Denmark. The international fame of the Little Mermaid is so immense that several other countries around the world were deeply impressed to have got sculpted the replicas of the statue to display them at prominent places for public viewing. The most notable among them named as “Mermaids of Earth” are located in Solvang, California (USA), International Peace Gardens, Salt Lake city, Utah (USA), Kimballton, Iowa (USA), Piatra, Niamt (Romania), Seoul (South Korea), Torrejon de Ardoz, Madrid (Spain). Some more approximately resembling copies have been installed in places like Sicily (Italy) and Siracusa (Greece). The International Airport of Copenhagen proudly displays a replica of the Little Mermaid along with the statue of Hans Christian Andersen, the author of the fairy tale of the same name. In addition to the Little Mermaid, Copenhagen houses a number of sightseeing places so numerous that tourists find it difficult to visit all the places in a single day or two. Tivoli Gardens (the 19th century amusement park updated to entertain the present-day travellers), Rosenborg Castle (the 17th century palace and museum), Christiansborg Palace, Rundetarn (the 17th century tower with an observatory/planetarium), Ny Carlsberg Glyptotek (the fine art museum of sculpture and painting), Frederik’s Church (the 18th century marble church with the largest dome in Scandinavia) are a few to mention. Tourists are advised to prepare a separate itinerary to suit their own tastes/preferences. Apart from Copenhagen, Denmark has a lot to offer for nature-lovers. If the visitors step on Faroe islands, they are sure to be cheered by abundant greenery everywhere. The slow plummet of giant waterfalls plunging headlong into the flat water bodies situated far below the craggy mountains modestly splashing a little froth steal the heart of distant observers. The thatched roofs of sporadically placed tiny huts too are fully covered with fresh green grass giving the little shacks altogether a special verdant look as if they have risen up to the surface from the grasslands spontaneously. The avian fauna is predominant with bright-beaked puffins and the green terrains offer plenty to enthusiastic ornithologists. If the tourists are profusely blessed with good luck, they may also watch the natural coloured strobes of northern lights (Aurora Borealis) which are likely to appear in the night sky between September to April, since the Faroe Islands are situated close enough to the north pole to exhibit sporadic flashes of the phenomenon. Greenland, on the other hand, is entirely a different a world from the rest. One does not get to see a lot of greenery (like in Faroe Islands), as wrongly suggested by its name. Greenland is replete with immeasurably vast dark blue water bodies and floating glaciers and snow-clad mountains. Eskimo settlements, snow terriers to pull sledges too form a part of unique sight to watch. Nuuk, the capital of Greenland, has for visitors the Greenland National Museum that houses the articles of local usage like kayaks, hunting equipment and some carvings. Greenland too offers the best chance to behold the northern lights of Aurora Borealis, if the visitors are determined to watch the phenomenon braving the bone-biting cold climate. Qaqortop in the south, Kangerlussuaq in the west and Ittoqqortoormiit in the east are suggested as the most suitable places for watching the natural colourful scintillations between September and March when the night sky is mostly cloud-free for displaying clear flashes. Denmark has earned special distinction in the comity of world nations as one of the most enticing nations for tourism, both within as well as in its constituent overseas territories.